Born in North Carolina and raised in Tennessee, James K. Polk was the son of a prosperous farmer and slave owner. Polk was often sickly and rarely took part in farm work, preferring reading and academics. He attended college, studied law, and later served in the Tennessee Legislature and the U.S. House of Representatives. Polk was governor of Tennessee and was also a strong supporter of Andrew Jackson. As President, Polk broadened the nation’s land holdings to include the Oregon Territory, which was shared by England and America; and Arizona, California, Colorado, Nevada, New Mexico, Texas, Utah, and Wyoming, which previously belonged to Mexico. James K. Polk was born near Pineville, Mecklenburg County, North Carolina on November 2, 1795. James K. Polk was born near e couple had no children. Sarah was very religious and didn’t believe in alcohol, gambling, or dancing. White House parties were quiet affairs. Polk deliberately started the Mexican War so he could lay claim to California. The Mexican War was longer and bloodier than he had expected, although the weak Mexican army eventually surrendered. The U.S. paid Mexico $15 million for the land it gained. Polk was often ill, but worked very hard as President. He died just a few months after leaving office. He didn’t trust banks and kept his money in bags in the house. When Polk died, he left his money to his wife, who lived another 42 years. He requested that she free their slaves after his death. 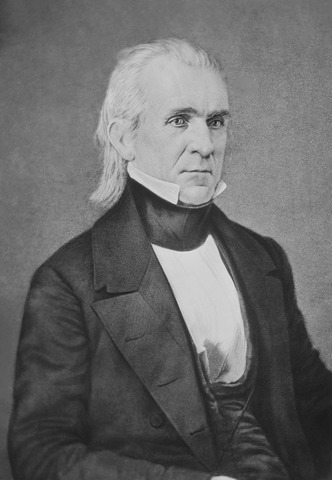 Question: Did James K. Polk support slavery? Declan, Tobin. " James K. Polk Facts for Kids ." Easy Science for Kids, Apr 2019. Web. 21 Apr 2019. < https://easyscienceforkids.com/james-k-polk/ >.